Picton Castle, Pembrokeshire – Graham Sutherland Gallery – one man exhibition entitled 'A Portrait of Cuba'. August 2006. 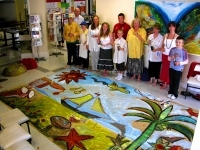 Youth Music Festival, Haverfordwest – Live Art painting and involving young people from the area. Finished canvas 10 m by 1.75 m.
Summer long exhibition of work at Bellini Restaurant, Haverfordwest showing art and food appreciation running side by side. Emrys Arts Haverfordwest – one man exhibition July 2006. Emrys Arts Carmarthen – one man exhibition July and August 2006. Merlin Festival Carmarthen – July 2006 – Live Art as part of annual festival celebrating Merlin. 2 canvasses created during day. 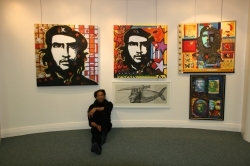 Haverfordwest Library – one man exhibition of large works exploring Cultural heritage of Cuba. During exhibition six sessions of workshops for schools and adult groups given on site using Raul's artwork as inspiration. Supported by Christine Willison – Arts Officer for Pembrokeshire. 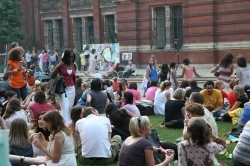 Victorian and Albert Museum, London 30th June 2006 Friday Late on Cuba – Live Art canvas 3m x 2m. Celebration of Cuban culture with live art, mask making, music and poetry reading running alongside major exhibition on Che Guevara as iconic image. Victoria and Albert Museum, London 1st July 2006 workshops with younger children in family groups creating headdresses from Raul's designs and painting large canvas (3m x 2m) of images suggested by children on a sea theme. 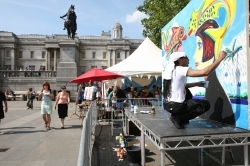 Trafalgar Square sponsored by V&A and the Lord Mayor of London 2nd July 2006 – Live Art on canvas 3m x 2m using traditional Cuban images. Concurrently working within and alongside workshops organized by V&A using Raul's headdress designs.